Well wasn't I pleasantly surprised? Hell yes, yes I was. And now I'm pleased to see a sequel out this year! Here's the first pic released for The Hangover II a little while back. And now we have a new image for the sequel sporting 3 of the main cast and a monkey in a denim jacket with a Rolling Stones logo on the back... The image doesn't just have one WTF moment in it either as you'll clearly see Zack Galifinakis with a shaved head, Ed Helms with a Mike Tyson-esque face tattoo and then back to Zack for the God-awful yellow Labrador t-shirt (which is just perfect for his totally whacko character). 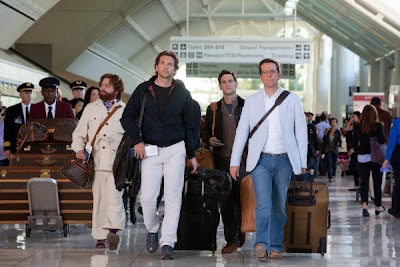 In the follow-up to the record-breaking hit comedy “The Hangover,” Phil (Bradley Cooper), Stu (Ed Helms), Alan (Zach Galifianakis) and Doug (Justin Bartha) travel to exotic Thailand for Stu’s wedding. After the unforgettable bachelor party in Las Vegas, Stu is taking no chances and has opted for a safe, subdued pre-wedding brunch. However, things don’t always go as planned. What happens in Vegas may stay in Vegas, but what happens in Bangkok can’t even be imagined.